Leading defense contractor, Randolph and Baldwin, Inc. needed a company to assess the energy usage at their headquarters in Ayer, MA., and to offer solutions for escalating energy costs. They choose MassAmerican Energy, LLC to provide a comprehensive solar solution. 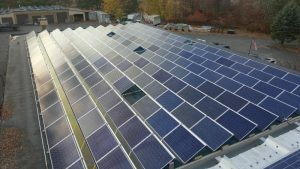 MassAmerican Energy designed a three-phase solar project which utilizes all available rooftops and ground space. The first of two large rooftop arrays was just completed with the second to follow shortly. A 650 kW ground mounted system will round out the project in Spring 2016.